Leading scientists have asserted that the best answers to radiative forcing (RF) climate change attribution can be found somewhere between cause and effect [1,2]. Given their determination that the actual cause was not the best answer, candidate populations of greenhouse gas (GHG) emission versus galactic cosmic ray (GCR) forcing notions then dominated the remaining publications on the topic. In my view, each concept is off center in comparison to both the observational record and to everyday thermodynamics, driven by solar radiation, characterized through clear hydrological and geochemical signatures, and used towards more accurate predictions of weather and climate. An alternate RF which does appear to meet all of those demanding conditions relates to the close match of the geostrophic enthalpy signature to incoming solar radiation. The observations of latent heat and atmospheric circulation behind the featured image are explored as part of a recent paper of mine in the Hydrological Sciences Journal , which also premiers new connections between solar cycles, the atmosphere, and surface water hydrology. In the image, the average latent heat component of RF is mapped for a selected 60 month period. The red hues reach to 250 W/m^2 and the blue hues reach down to -250 W/m^2. According to Gray et al. the average solar forcing radiating upon the Earth (and accounting for a spinning planet including its albedo) is approximately 239 W/m^2. The equivalence is not surprising and signifies to me at least, the hydrologically linked saturation and desaturation of latent heat (a change in enthalpy) within the geostrophic atmosphere across each of those important zonal and gyre related climatological scaled circulations. These relations also likely dominate in related areas of research such as isotopic atmospheric hot spots. There appears to be no plausible explanation for the match in signatures, other than the solar radiant forcing of the hydrosphere. ** In addition to that spatial equivalence, the paper identified a trend of strong time-lagged correlations between solar cycles and the latent heat component, along with its moisture-signifying cousins across the same western pacific equatorial footprint, including trade winds (TWWP) and outgoing longwave radiation (OLR). The paper goes on to focus on river forecasting in the Southern Rocky Mountains, but also surveys some interesting prior works relating the sun to climate. 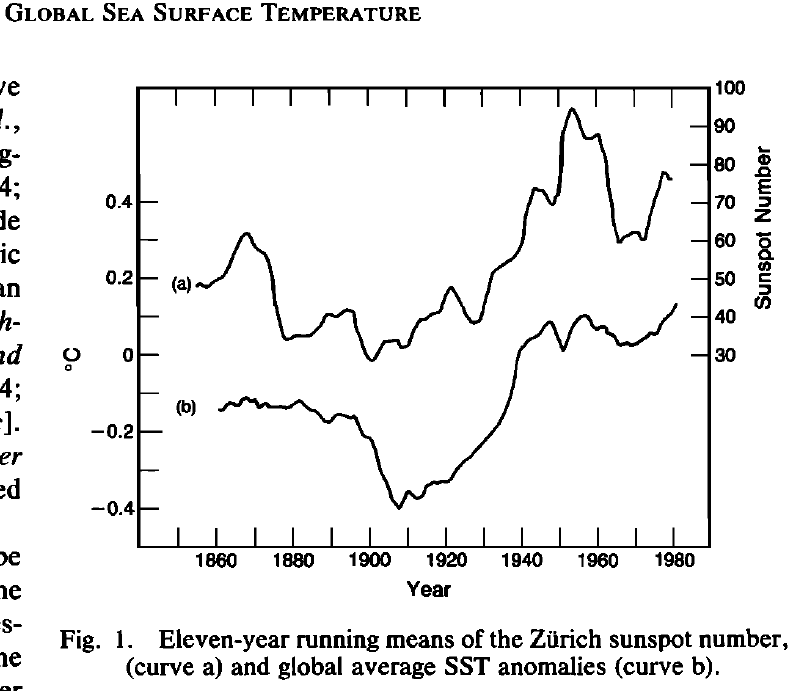 One paper which I’ve only recently studied more closely is by Reid  which includes this time series chart overlay of average 11 year running means of global sea surface temperature and also of the Sunspot Numbers (SSNs) across a centennial time frame. 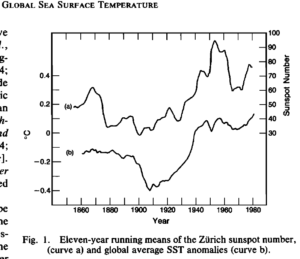 If the connection in the figure between solar cycles and global sea surface temperatures were not already clear enough to any viewer, the author additionally indicated that “The formal cross-correlation coefficient between the two time series is 0.75, significant at above the 95% level, even after taking the high degree of autocorrelation in the individual series into account..”. I applied similar statistical significance tests in my paper and similar results were observed. I accordingly think Reid’s SST vs solar cycle observation record corroborates my paper’s solar forcing argument, and vice versa. If I am correct, this should nominally move the mainstream attribution of primary RF closer again towards solar causation. I believe this could happen soon because scientists have argued until now that it was difficult to “find (climate) measurements that are only influenced by a single cause” . The only solar cycle related RF notion which is widely recognized by the mainstream climate science community has been the galactic cosmic ray (GCR) climate forcing theory . The notion relates that clouds will form more robustly when a moist atmosphere is irradiated by GCRs. Although this has not been confirmed, the notion also recognizes that as sunspot numbers rise, the magnitude of GCRs reaching the Earth drops, and as the sunspot numbers drop, the GCR magnitude rises. Gray et al. follow with the obvious conclusion that because GCRS are highly negatively correlated to solar cycles, any climate feature which correlated with GCRs would also correlate with the energy forcing of SSNs and so uniqueness of forcing could not be corroborated. In my view the GCR theory does not appear to explain additional and more comprehensive phenomena, including the essential question of what RF agent evaporates more or less moisture into the atmosphere in the first place. On the other hand, through the geostrophic enthalpy approach, the crucial energy and mass balances between solar forcing and the hydrosphere appear to be graphically evident, and the lagged temporal correlations reinforce. Accordingly this new work appears to address what the UN IPCC scientific community maintains is an important deficiency; the lack of a “robust association between changes in cosmic rays and cloudiness” [see 1,2]. The two notions of GCRs and GHGs appear strangely joined at the hip to me. As I introduced, they each seem to fail conditions associated with everyday thermodynamics, driven by solar radiation, characterized through clear hydrological and geochemical signatures, and used towards more accurate predictions of weather and climate. Although once widely considered plausible by subject matter experts, the notion of solar cycle climate forcing has been rejected from mainstream scientific guidance on climate change since the publication of Reid’s figure [1,2,4,7]. I expect that once the solar cycle correlations to the actual latent heat exchange and storage contributions of the hydrosphere are more widely recognized, and once the resulting and accurate hydro forecasts are appreciated, then an alternate, less threatening conceptual model of our global climate state will emerge. * Time scales are identified here to range from annual to decadal across the first 36 years of the satellite era beginning in 1979). Radiative Forcing is conceptualized here in a geostrophic perspective. ** Typically climate scientists assign only a fraction of the correct value. I have not found assignments to latent heat greater than 80 or 90 W/m^2. Here is a random example https://en.wikipedia.org/wiki/Radiative_forcing That wikipedia page also brings home the importance of this challenge, given its bar chart which claims solar forcing is among the lowest forcing agents on their list. Wallace, M.G. 2019. 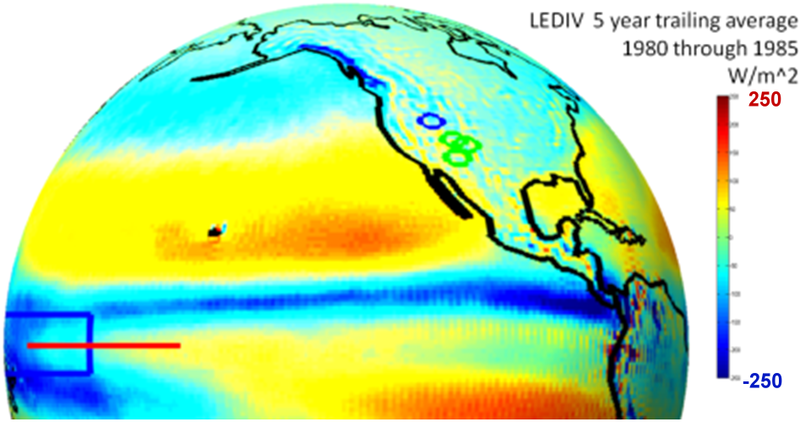 Application of lagged correlations between solar cycles and hydrosphere components towards sub-decadal forecasts of streamflows in the Western USA. Hydrological Sciences Journal, Volume 63 January doi:10.1080/02626667.2019. Svensmark, H., Bondo, T. and Svensmark, J. 2009. Cosmic ray decreases affect atmospheric aerosols and clouds. Geophysical Research Letters, 36, 1-4.
data munging, contouring and spherical mapping applied by me towards my Ph.D. topic and .